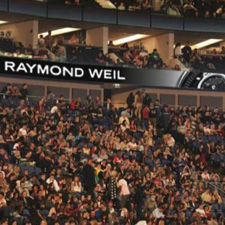 Watchmaker Raymond Weil has pleased his fans with a new model of elegant watches Maestro Lady, combining classic beauty and high technology. The elegant novelty Maestro Lady is the owner of a round polished stainless steel with soft feminine lines. The housing diameter is 30 mm and thickness - 8,65 mm. The case is equipped with a sapphire crystal with double-sided anti-reflective coating. Sapphire glass is attached to the case by the steel bezel, decorated with 76 diamonds. The sapphire glass is used as a transparent back cover. The crown at the position 3 on the top is decorated with a sapphire. 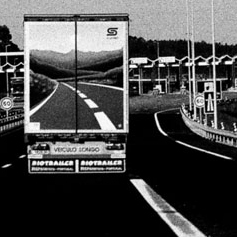 The housing provides a 50-meter water resistance. 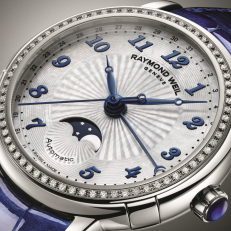 The guilloche white mother of pearl dial is marked with three-dimensional Roman numerals, alternating with 6 diamonds. The hands are made in the new shape of Breguet. Time is indexed on the dial by the central hands of hour, minute and second. The date aperture is set at the position of 3 hour. The dial is controlled by the manufactory automatic movement RW2000, collected at 25 rubies. The mechanism provides a 38-hour power reserve. The novelty comes on a crocodile strap with steel buckle.